Nordic Service Group aims to be the strongest brand on the market and the partner that private and public organizations as well as hospitals and laboratories prefer. Our customers will enjoy the benefits of relying on the market’s most powerful service organization with engineers possessing a high degree of professional expertise. We keep strengthening our name and reputation through our urge to learn more and by sharing our professional knowledge with others in our industry. Our strength and our reputation are based on making our customers even more efficient. Relying on our professional skills and knowledge, we can quickly and precisely make a diagnosis on the phone or right onsite. We are always close by since you will find us located in more than 10 locations evenly distributed among the four major Nordic countries. By 2019, it will have been 28 years since a young technician, Jesper Jørgensen, launched the company, Dansk Medico Service, whose goal was to repair hospital and laboratory equipment. He had set up his workshop in his home in Jyderup. The company was given its present name in 2002 in conjunction with an expanded partnership with subsidiaries in the other Nordic countries and two years later NSG entered into a partnership with these companies. NSG is still privately owned by Jesper Jörgensen. Jyderup, a railway town in Vestsjælland, Denmark, is still the headquarters of the organization but the name, assignments and number of employees have changed dramatically since 1991. Today, Nordic Service Group is headquartered in a large industrial facility. In 2018, we had over 75 employees located in more than 10 locations in Norway, Sweden, Finland and Denmark. Picture on the left: Young Jesper Jørgensen performing a measurement. 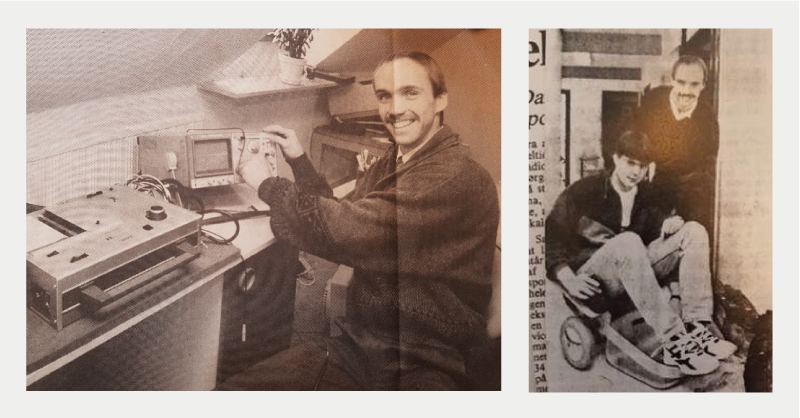 Picture on the right: Jesper and our current Nordic Service Manager who joined in the company in 1994. How can our customers benefit from our Nordic network? 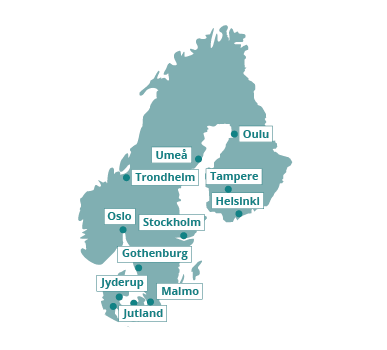 You can use our services locally and throughout the Nordic region. From the manufacturer point of view, this creates a remarkable opportunity to cooperate considering a service partnership. As an independent business partner, we get things to work. We act with a high degree of openness, trustworthiness and respect towards our customers and colleagues. When we receive an assignment from customers and colleagues, we act quickly and follow the agreed procedures in order to live up to our customer’s expectations. Our biomedical engineers are certified by the international companies we cooperate with. We accept new products, new working methods and the changing needs of our customers with great curiosity. Our know-how is trusted by many equipment manufacturers. We are a prestigious service organization for several global brands. Support from a strong Nordic group is reliable and efficient. We are always close to you and ready to help.